The first beta test for the crowdfunded MMO Camelot Unchained, which was originally supposed to take place in August, may not actually happen until sometime next year. In a pre-recorded message that aired on Twitch late last week, City State Entertainment founder Mark Jacobs blamed the delay on the loss of a senior programmer, who resigned from the studio almost immediately after his lengthy hiring process had been completed. "After many months of not only searching for the right guy, but [also] negotiations, we thought we had the right guy. On Monday when I did the update, I spoke to him. Everything was great. Monday evening, after the update, I spoke to him. Everything was great," Jacobs explained. The next day, Jacobs' wife underwent surgery, and so he was disconnected from what was happening at the studio. But things went sideways on Wednesday. "I received an email from the programmer, Kevin, that said that he had received an offer that he just couldn't turn down. One of those offers that come along once in a lifetime," he continued. "As you can imagine, I was a bit perturbed. Upset. Disappointed. Mad." To his credit, Jacobs appears about as magnanimous about the situation as anyone could reasonably expect, but the surprise loss left the studio with no choice but to push the beta. "We knew that it was going to be tight with the beta," he continued. "We thought with somebody as talented as he is, that we'd have a much better shot at it... Right now, frankly, I can't say with a straight face that we have any shot at making beta at the end of August." Jacobs told Massively Overpowered that at this point, it's possible the beta won't begin until sometime next year. "When you are working with a small team, the loss of a couple of people can make a huge difference, so it would be foolish for me to say that nothing bad could possibly happen over the next few months," he said. "On the other hand, things are moving along nicely for the team size we have, and we are pretty confident that we can get an awful lot done before the end of the year." 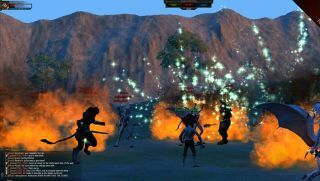 This isn't the first time that Camelot Unchained, which was Kickstarted to the tune of $2.2 million in 2013, has run into a snag: The alpha test was originally slated to run in August of 2014, but was eventually pushed into early 2015.